Wow, I meant to type this post up ages ago! 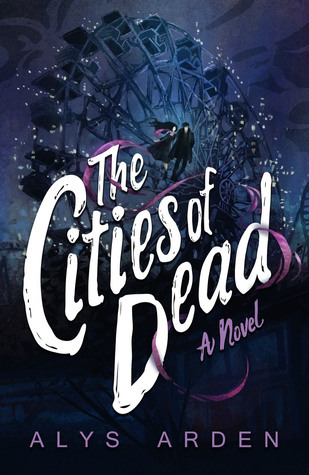 I first read The Casquette Girls by Alys Arden a few months ago, and I read the sequel, The Romeo Catchers in December to prep for The Cities of Dead. I’m planning to read the most recent instalment this month since it just came out and I have no chill. Oh also, it’s friggin’ beautiful. Just looking at the cover doesn’t do it justice. There’s something about holding these books in your hand. They are hefty and loaded with magic. They are also not my normal type of reading but I am in LOVE with the characters. I will acknowledge that people who are really averse to insta-love/ insta-lust, love triangles, or just a big focus on romance plots in general probably won’t enjoy these books. Usually, I do fall into that camp, but for some reason, this series just works for me. I think it’s because I’m obsessed with witches. So let’s talk magic! The magic in this series is revealed somewhat slowly throughout the first book, and that was awesome. The main character, Adele, is trying to figure out how to live in a storm-ravaged New Orleans. Many of her friends have left, so it’s really like a whole new world. The aftermath of the storm creates an almost dystopian vibe that brings so much gravitas to this story full of vampires and witches. Adele soon learns about the magical beings that have come to the city, she accidentally reverses a spell holding some evil creatures at bay, and, well, all hell breaks loose. I won’t spoil anything (because deep down I really want everyone to try these books, it’s 99 cents on Amazon!) but trust me when I say that no one is what they appear to be. Adele finds herself trapped between 2 primary love interests. I personally found myself rooting for both of them at various points as we learn more about Adele’s family and her connection to the magic of New Orleans. At this point I find myself firmly in a different camp than I was when I started The Romeo Catchers, and I am still reeling over the reveals that led to my shift in opinion. Alys Arden definitely knows how to mess with my feelings! The settings is kind of a character unto itself. I can so easily picture the locations Adele visits throughout the story. Everything feels so familiar somehow, even though I have never visited New Orleans. If you are a fan of Buffy, Charmed, or The Craft I would definitely recommend this book to you. It has a lot of found family vibes and some big characters that will steal your heart. Even though it includes a lot of elements I normally wouldn’t enjoy, I find myself getting sucked into the story because it’s just so dang fun! The author herself is unapologetic about things like the love triangle, and I love that. It’s no secret that the series contains a fair amount of campiness, and that’s a big part of its charm. I would love to know what you thought of this series if you’ve read it. I can’t wait to dig into book 3 soon, and I will definitely follow up with my thoughts on that one after I do. I also want to shout out my Bookstagram bud Kat @notthepathtonarnia for getting me to fall in love with Adele & her witchy crew. So many books out there! !